I love how these people kill an animal and then talk about how they have “brought it to life”. Check out the last page in this pictorial. It is really bizarre. AMAZINGLY lifelike, the mounted body of the world’s largest gorilla, a 500-pound giant, is being put on exhibition at the Academy of Natural Sciences, in Philadelphia, Pa. The enormous brute, together with its mate and baby, were bagged by a recent West African expedition led by George Vanderbilt, New York sportsman and explorer. The delicate work of mounting the gorillas was accomplished at the Jonas Brothers Studios, in Mt. Vernon, N. Y. 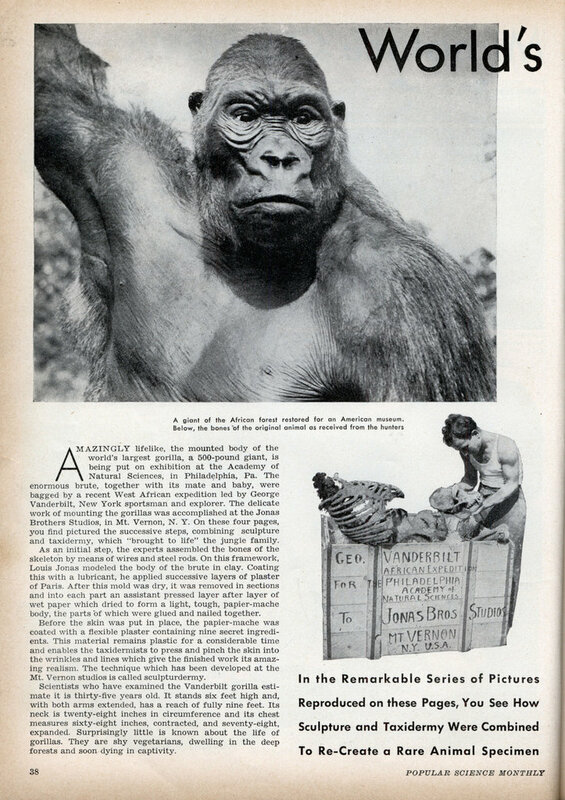 On these four pages, you find pictured the successive steps, combining sculpture and taxidermy, which “brought to life” the jungle family. As an initial step, the experts assembled the bones of the skeleton by means of wires and steel rods. On this framework, Louis Jonas modeled the body of the brute in clay. Coating this with a lubricant, he applied successive layers of plaster of Paris. After this mold was dry, it was removed in sections and into each part an assistant pressed layer after layer of wet paper which dried to form a light, tough, papier-mache body, the parts of which were glued and nailed together. Before the skin was put in place, the papier-mache was coated with a flexible plaster containing nine secret ingredients. This material remains plastic for a considerable time and enables the taxidermists to press and pinch the skin into the wrinkles and lines which give the finished work its amazing realism. The technique which has been developed at the Mt. Vernon studios is called sculpturdermy. Scientists who have examined the Vanderbilt gorilla estimate it is thirty-five years old. It stands six feet high and, with both arms extended, has a reach of fully nine feet. Its neck is twenty-eight inches in circumference and its chest measures sixty-eight inches, contracted, and seventy-eight, expanded. Surprisingly little is known about the life of gorillas. They are shy vegetarians, dwelling in the deep forests and soon dying in captivity. I really love these killer human primates. They emasculated him, didn’t they? violated every rule of Fair Chase, taking only what you can eat and making use of everything that you take. You’re making a mistake. 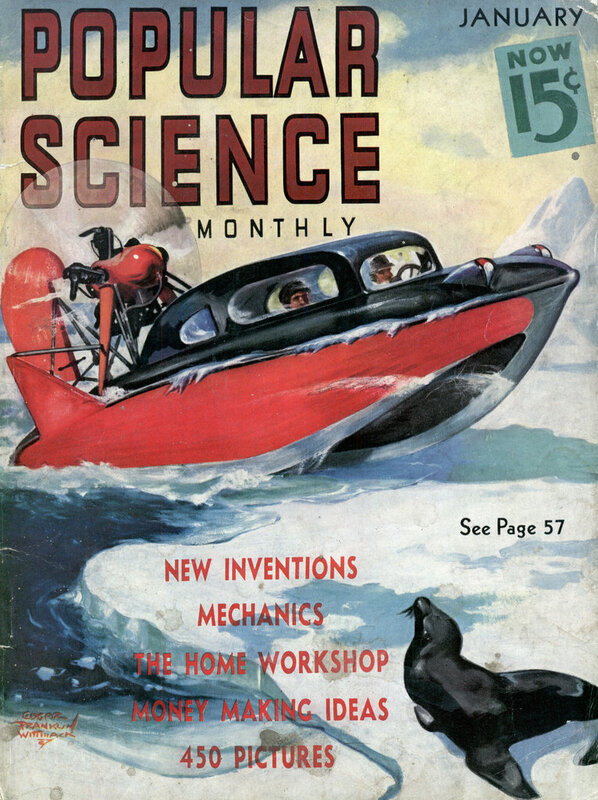 You assume that a modern-day Vanderbilt would do the same thing, and that Popular Science would trumpet its success. You cannot apply today’s morals and social concience to the past. While some people haven’t learned the lessons you have, I like to think most of us would look on this with sadness, but understand that this was a less enlightened time. Farther back, even more so. Just learn from it and don’t go back. Many of today’s animals are smaller than they were just a couple of hundred years ago because of human hunters. A good example of this is the sperm whale. 200 years ago, the bull sperm whale averaged 80 feet long. There were even rare 90 footers out there. We know this to be fact because of the jaws collected by these early whalers. It seems reasonable to me that, after more than a hundred years of trophy hunters killing the biggest and strongest of the gorillas, that there were, 150 years ago, bigger apes than we have in today’s world. Not King Kong, but bigger never-the-less. It is because of man’s ego that he always wants to kill the healthiest and biggest of his quarry. This leaves the smaller weaker males to breed more like themselves.